Chalet Buchille – alpine tradition, eight minutes from village centre..
Chalet Buchille provides a rare combination of superb views, excellent accommodation and a very convenient position. 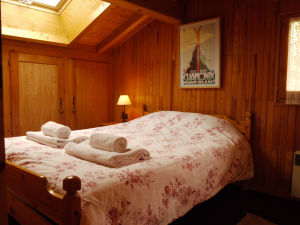 The centre of Morzine and the Super Morzine ski lift are just eight minutes` walk (800 metres) away from the chalet. Skis can be hired and stored at Intersport next to the lift, thus eliminating the need to carry them back and forth each day. For those looking for a change of scene, the bus to the Ardent lifts leaves from just across the road from the chalet and passes every 30 minutes. You can also take this bus in the other direction to the village centre, just near the main local supermarket – Carrefour. 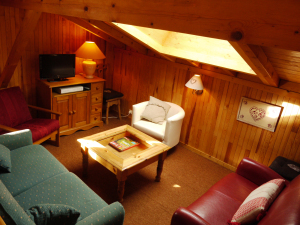 The chalet is of modern construction and has been furnished to a high standard throughout. The ground floor has a fully equipped kitchen with dishwasher, fridge-freezer, oven, hob, microwave and washing machine. The dining area has seating for 8 and a wood burning fire which is a real delight after a hard day`s skiing! From this room large doors give access to the balcony which runs around the chalet and from which there are truly superb views of Morzine and the snow covered mountains beyond. On this floor there is also a bedroom with two single beds, a bathroom with wash basin, bath with a shower and a separate WC. The first floor has two double bedrooms and a cosy sitting area on the mezzanine overlooking the living area. An i-pod dock, DVD player, English TV, free wi-fi and books and games are all provided by us to ensure that everyone is well entertained. The lower ground floor has a totally independent studio apartment with twin beds, a small kitchenette area and a bathroom and WC. Outside the chalet is surrounded by a large private garden. There is parking for several cars in front of the chalet and an integrated garage and a ski store. 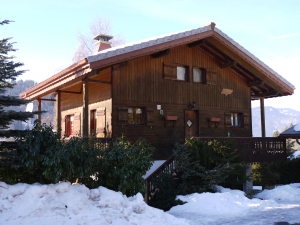 Chalet Buchille is a lovely peaceful alpine property, conveniently located just outside the hustle and bustle of the village centre.